The scientific literature is the primary source for the ODP’s data. For the typical user who does not have access to an academic library, options are now in place for free access to published work. Several excellent resources are already in place, so we will link to them here. 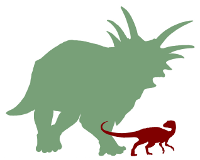 Directory of Open Access Bio and Paleo Journals, hosted at SV-POW! Beyond these links, we make special note of the journals published by the American Museum of Natural History. All of these publications – with many, many relevant measurements for a number of dinosaurs (hint, hint) – are freely available here. I am a faculty member of the Geology Dept. at Portland State UNiversity in Portland OR and am a paleobiologist and educator. I am teaching a course called The Natural History of Dinosaurs and have neen collecting journal articles for some time now. I am planning on making these available via a website I am building. My students and myself are collecting a lot of information about many dinosaurs, pterosaurs, plesiosaurs, etc. I love this stuff and plan on spending the rest of my career in the dino research business and educational outreach. Best way to teach and learn about how science works, I think. Excellent! I look forward to hearing if you’re able to incorporate some aspect of the ODP into your class!